Note: I plan on ordering an Emerson prewired harness with either 500k or 1meg pots, based on your recommendations. I would personally go with the 1megs, but I know some builders like Lollar recommend the 500ks. Novak: I'm a little bit biased going towards the Novak route, as he seems to be the guru when it comes to wide ranges, hence the heavy work with Lee from sonic youth. Curtis has obviously done a TON of research into remaking these pickups to the same voicing with modern materials. $420 for a set with mounting hardware. Lollar: Probably everyone's go to for Wide ranges in new builds, (Looking at you, Dano). Lollar is a big name for humbuckers as I am aware. Not a fan of the big Lollar logo. Fralin: As I understand, Fralin is more of a single coil kind of guy, so I am not familiar with the quality of his humbuckers. That being said, they look and sound good. Creamery: One of the first companies I had ever looked up when I had first started researching Wide Ranges. I like the ability to order custom string spacing for each pickup to fit different builds, but I think the rounded covers look kind of strange. ~$310 for a set, plus shipping overseas. Porter: I had almost forgotten about this company until I was watching a JHS video where Scott was playing a Porter guitar and was raving about his pickups. I have no idea how they compare to other builders in term of construction, but the price is certainly attractive. Mojotone: In the same price bracket as the Porters, I really don't know much about them other than the occasional "OMG these pickups are great!" posts I see on here. I'd love to hear what you guys prefer and recommend and the major differences between all these, and if there are any builders that I left out! The only WRHBs I've ever tried are the ones on the VM Deluxe Telecaster I used to own - maybe they were the same as on your MIM, maybe not, but I wasn't very impressed. I never tried swapping the pots to 1M, though. The new CV Deluxe Teles are supposed to come with "redesigned" WRHBs (whatever that means), or at least that's what the Fender rep said on a NAMM video. Maybe that's something to check out before spending vintage money on something that's more of an approximation? The Duncan Custom Shop also makes WRHBs with Alnico pole pieces. $360 a set, I think. Arcane Pickups makes them with Alnico as well, Trussart Guitars uses them sometimes but I couldn't find any firsthand info. Then there's a question of pickup builders thinking they have Alnico but it's really FeCrCo. It all gave me a headache so I decided to splash out for a pair of vintage WRHBs. I had a Bilt Zaftig with Lollar Regals for a bit and I did think they sounded fantastic in that. If I didn't already have the vintage ones I bought I'd probably just get Regals and not dive down the rabbit hole. There are so many options now and almost no one has experience with them all (since it would take $3500 to collect enough for a proper shootout). Last edited by wooderson on Sat Feb 02, 2019 1:26 pm, edited 1 time in total. I've tried vintage, Lollar Regal, Novak JM-WR, and Fender Reissues. Of these I liked the vintage best in the bridge and the Lollar in the neck. The Lollars sound a good bit like the originals, but with added clarity and a bit more high end. I preferred them with 500k pots over 1M, which work better with the originals. At the neck Regals have a kind of wooly bluster that sounds great They can howl, but they can be sweet too. In the bridge, they're quite versatile as well, but sometimes they sounded a little harsh depending on the drive I paired them with. I could tame that harshness with the tone knob, but with a single tone knob setup, I found it difficult to keep the neck as bright as I liked while dialing back the bridge to its sweet spot. I did use a mixed Regal neck/vintage bridge pairing, loved that, and thought it might be worth trying an all alnico rod one like a Porter at the bridge since Alnico is supposed to be closer in tone to the original Cunife. I think you'd be ok in a Tele Deluxe though since you could change up your settings to suit. I had a set of vintage ones and a MIJ 2007 Tele Deluxe that had the newer revoiced WRs in it. To my ears and a few of my friends, the difference in sound was minimal at best and more likely just the difference in tone from the guitars themselves. I put a Novak in the bridge position of a Cobain Mustang. Sounds really nice and thick, possibly a tad too dark due to the stock 250k pots in there. At some point I'll put a 500k in there. Still a really nice pickup, like everything Novak does. I previously tried Brandonwounds in the Tele, which were nice (and relatively cheap), but a bit too thick and wooly for my tastes. I reckon all the builders you listed (plus more) make great pickups...in the end the relatively small differences become a matter of personal taste. Good luck in the search, and let us know how you go! Interesting that you put it in a cobain! Sounds like a really cool idea.. I’m sure they sound a bit darker, but it’s not pure mud with those 250k pots is it? Just curious. I just put in a Novak WRHB in my American pro. jazzmaster today. Fantastic sound, with 500k pots. I also own the originals in a 75 Tele Deluxe. I feel as though I’m comparing apples to oranges in ways, because to me, telecasters feel spankier and that definitely comes through in the pickups. Anyway, I love the original WRHB. I’m a gigging musician and I play lots of different matieral from sparkly cleans to highly overdriven stuff, all through a ‘68 Custom Twin. The original works for almost anything, BUT for some of the distorted stuff, it is a tad shrill. I find the Novak WRHB’s WORK the same way as the original, meaning they have the same sort of response, same sort of feel as the original. I felt right at home when I started playing it. But it lacks some of those shrill highs, even though it’s still a bright pickup. Perhaps it’s the 500k pots, but it really did shave off that extra bite without shaving too much, which is a welcome change. The originals sound better clean, but not by TOO much. They are twangier and slightly more responsive, again, possibly because of the 1meg, but it’s not a marginal enough difference, in my opinion. Now this is the kind of response I was looking for! I had no idea that there was another alloy in use by some manufacturers, I figured everyone was using some kind of alnico 2/5 blend and maybe some ceramics here and there. What does FeCrCo bring that alnico doesn't? I don't really understand what you're saying here, why would I want to downgrade to Squier pickups from the mexis? The Lollars sound a good bit like the originals, but with added clarity and a bit more high end. I preferred them with 500k pots over 1M, which work better with the originals. ...and thought it might be worth trying an all alnico rod one like a Porter at the bridge since Alnico is supposed to be closer in tone to the original Cunife. I think you'd be ok in a Tele Deluxe though since you could change up your settings to suit. What makes you think that the 1megs work better with the vintage pickups and vice versa? Is it due to the original CuNiFe in the vintage ones? And what is the difference from the Duncan custom shop ones made with threaded alnico and porter's which are just straight magnets? What is the difference between the reissue WRs and the "revoiced" ones? When did Fender make the switch? The Tele Deluxe I have was built within the last two years or so, so I assume it has the newer ones. When I was looking into WRHB options, I read a post by someone ( I think it was Telenator) stating that FeCrCo has a bright, harsh character, whereas Cunife is closer in tone to Alnico (apparently Seth Lover said something about their similarity as well—that Alnico would have been fine but couldn't be threaded). Lollar uses a mix of FeCrCo threaded and Alnico unthreaded to tame the harshness, and Lollar usually recommends 500k with those. When I compared them in a Zaftig with different pot values, the vintage ones sounded best (more high end sparkle) at the traditional 1M and the Regals, which I thought were a bit shrill at 1M, mellowed out nicely at 500k without losing too much high end. Not sure about the details of Fender’s WRHB production. All I know is that I probably couldn’t have honestly picked vintage from reissue (and certainly not in a band mix). Compared them to my vintage set in a Tele and to Tim at Tym Guitars’ WRHB equipped Jazzmaster and we all had the same opinion. The sound was close enough not to matter. And certainly not enough to warrant the price of the vintage ones. All the searching for that extra 2% better this and that will mean nothing once other instruments are involved or the sound guy EQ’s out that top end in the mix etc. I also have a Creamery WRHB which sounds great. +1 for Creamery WRHB's. I've got one (neck only) in a custom Tele Custom and I love it. Ordered it from Jaime as a 4-conductor to do some splitting, and it sounds glorious. Split single coils sound almost Strat-like. Please set me straight if this is just how some conventionally constructed humbuckers look. 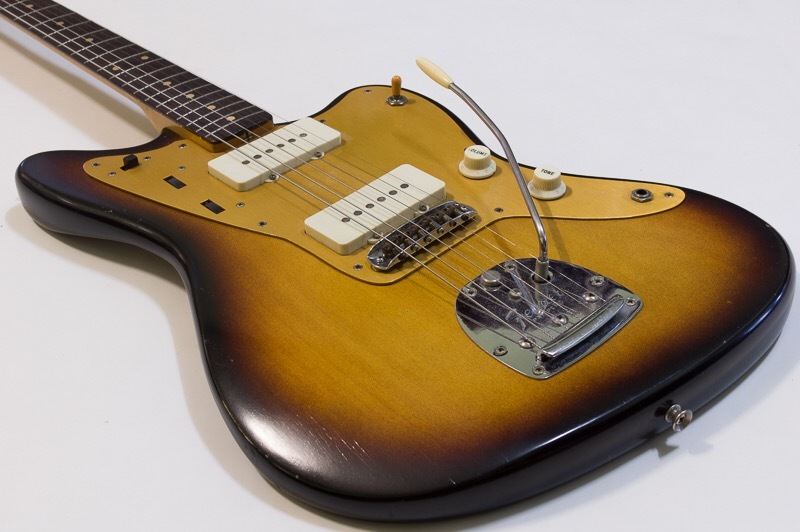 I think it'd be very interesting if there is a factory in China making alnico pole piece humbuckers. What I haven't seen mentioned in this thread yet is Jess Loureiro,. He makes probably the cheapest set of any mentioned here (about 80€ a pickup), just around vintage output and uses "screw-shaped" AlNiCo pole pieces as opposed to threaded FeCrCo. I haven't tried them or anything, but it seems like a nice bet if you want to dip your toes in the water.